The airship of ‘boy aviator’ Cromwell Dixon was among the international array of biplanes, monoplanes and balloons assembled for the Harvard-Boston Aero-Meet in 1910. Dixon, who lost his father at a young age, had invented his ‘sky-cycle’ at age 14. Encouraged by his mother, he had already exhibited it around the country for several years–sometimes sending her up in his machine. For this display, months after the first, high profile airmeet in Los Angeles, Harvard organizers leased 700 acres in Atlantic, MA –now Squantum– and promptly named them Harvard Aero Field. In ten days of contests held in September participants competed for speed, altitude, duration, distance. Events also included interestingly, ”Dropping Bombs on Battle ship,’ and ‘the Boston Globe Special’–no clue. President Howard Taft was in attendance. The person who has not seen a flight before tiptoes breathless on first witnessing the marvel of a machine leaving the ground. This afternoon when the first machine went up, a policeman from one of the suburban details on duty at the grounds quite lost his official reserve, and danced up and down like a boy at a ball game. “Gee, but that’s great!” said he. “Ain’t that great? Why, that’s the greatest thing I ever saw in all my life.” And the good man was on duty all the time. At the beginning of the twentieth century, the contestants in air meets did a lot to create visibility, and a sense of the viability and possibilities of human flight. They also became a lot of the early casualties of what was still an erratic and dangerous activity. Dixon died the year after this meet in an accident, at age 19. This occured days after he become the first pilot to cross the Continental Divide. See more airships after the jump. This entry was posted in Science&Tech and tagged Aeromeet, Airship, Boston, Boston Globe, Harvard, Howard Taft, Transportation. Bookmark the permalink. The Boston Globe Special may refer to the $10,000 prize that the newspaper offered for the fastest time for two nonstop laps from the Squantum airfield to Boston Light. 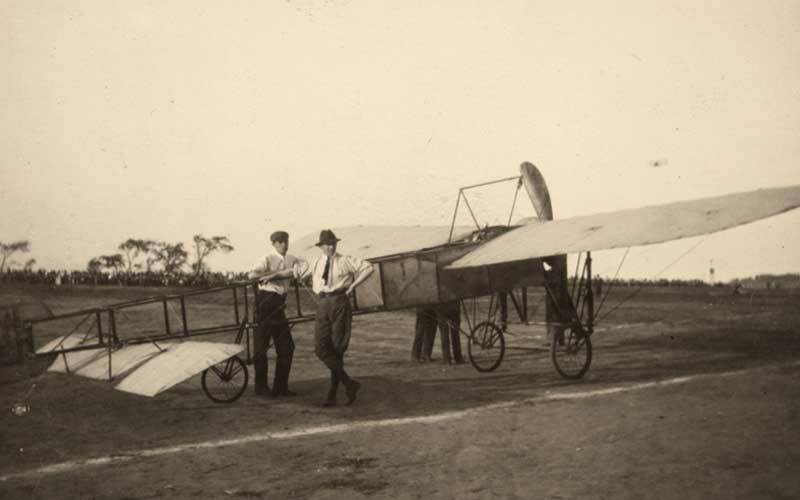 English aviator Claude Grahame-White was the only competitor to successfully complete the feat. The Globe called it the “first great race by a birdman ever seen in this part of the world.” I think the Globe may have also sponsored a race course that included circling the dome of the State House, so the reference may be to that competition.